A Literary Odyssey: Book 97: Finished. The tale of Janie Crawford begins when she returns to town at the notice of a bunch of nosy neighbors. having been gone for a few years, the sight of her walking down the street after running away with a drifter and marrying him, sets the town all atwitter and gossiping. When an old friend, Phoeby, comes by to talk to Janie, Janie recounts her life from as far she can remember. And Janie's life was focused on the three men she married and the life she had with each of them. With her first husband, Janie was married off at a young age to avoid falling prey to other men around her. But she was unhappy and felt that with marriage, you should have love. But her husband felt otherwise. "She often spoke to falling seeds and said, "Ah hope you fall on soft ground," because she had heard seeds saying that to each other as they passed. The familiar people and things had failed her so she hung over the gate and looked up the road towards way off. She knew now that marriage did not make love. Janie's first dream was dead, so she became a woman." I feel like in this day and age, especially here in the U.S., it is hard to see why someone would be in a marriage without love. As kids, many of us grew up with that "fairy-tale" dream of wedded bliss. Obviously I love my husband very much and wouldn't have married him if I didn't. :) But there are still places, even here, where that doesn't happen. And I always feel for those individuals because a loving and whole marriage is a beautiful thing. But for Janie, that wasn't possible in her first marriage. Her husband wanted a partner, and someone to help with the work. And of course, some marriages are like that. One partner doesn't go in with the same thoughts and heart that the other does and...kaput. "Two things everybody's got tuh do fuh theyselves. They got tuh go tuh God, and they got tuh find out about livin' fuh theyselves." She marries again and soon realizes she is just arm candy. It isn't until she meets Tea Cake that she understands real and true love. I loved her journey. She struggled to come to terms with what she wanted for herself and what the society around her wanted her to have. The relationship with her second husband is one that really broke my heart. How can you stay with someone who doesn't let you be yourself? 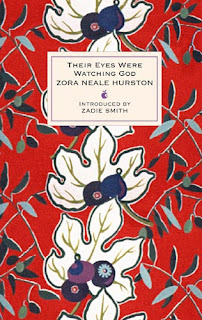 But what really made me fall in love with the novel was how Hurston captured the voices of the characters she was writing about. Janie seemed so real in her pain and thoughts that it was almost as if she was talking directly to me about her life and what she had been through. I liked that aspect. "Janie looked down on him and felt a self-crushing love. So her soul crawled out from its hiding place." The way the novel approached love also seemed so real. Sometimes there are moments when all you feel is this big surge of love and adoration for the person in front of you. There were quite a few scenes that really captured this emotion. It made it so real and not just a portrayal of one character falling in love with another. There are, of course, other things I can mention about the book. There is a lot about the relationship between blacks and whites during the time period, women's rights, etc, but those are all aspects that seemed to pale in comparison to the love story going on. I like a good love story, what can I say? But I loved the power and majesty of it all, the language and dialect (which did take a while to get used to), and the characters. These are characters I will remember. "It is so easy to be hopeful in the daytime when you can see the things you wish on. But it was night, it stayed night. Night was striding across nothingness with the whole round world in his hands . . . They sat in company with the others in other shanties, their eyes straining against cruel walls and their souls asking if He meant to measure their puny might against His. They seemed to be staring at the dark, but their eyes were watching God." Okay. I still can't remember if I've read this. Sounds vaguely familiar, but that doesn't mean anything. I'll have to tackle it again (or for the first time?) and make it stick. Thanks for sharing your thoughts.